Restorative yoga is a beautiful style of yoga that’s both powerful and gentle. It’s a practice of passively BEing, rather than actively DOing. 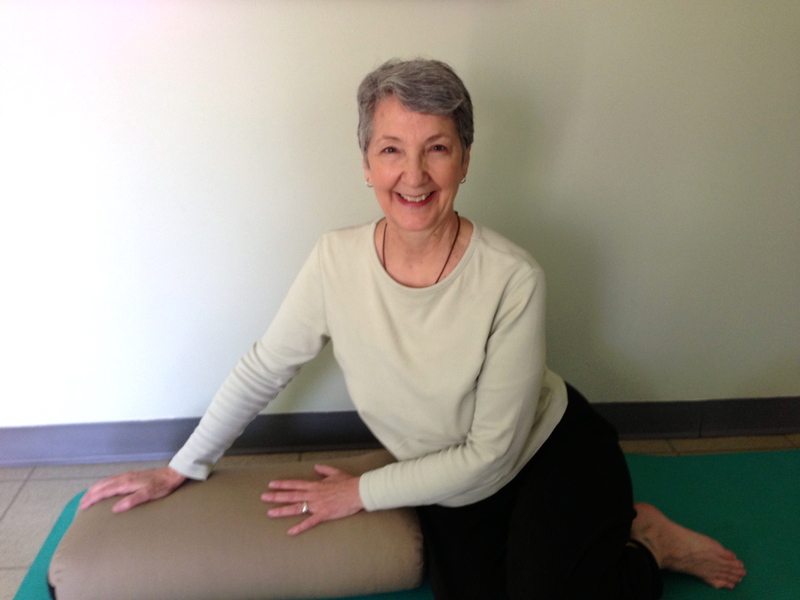 Deeply relaxing and revitalizing, restorative yoga opens, releases, and restores—body, mind, and spirit. 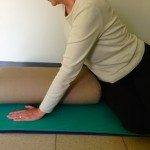 You may remember from last month’s article that restorative yoga is a term for yoga poses done with the full s upport of bolsters, straps, blankets, or blocks—allowing the practitioner to comfortably sink into a pose that’s held for between 5 and 10 minutes so they can be completely relaxed, absorbed, and present. Supported Seated Twist is wonderful for helping to gently stretch the back, the side body, and the intercostal muscles in-between the ribs. This pose provides extra space for the lungs and diaphragm—for breath. 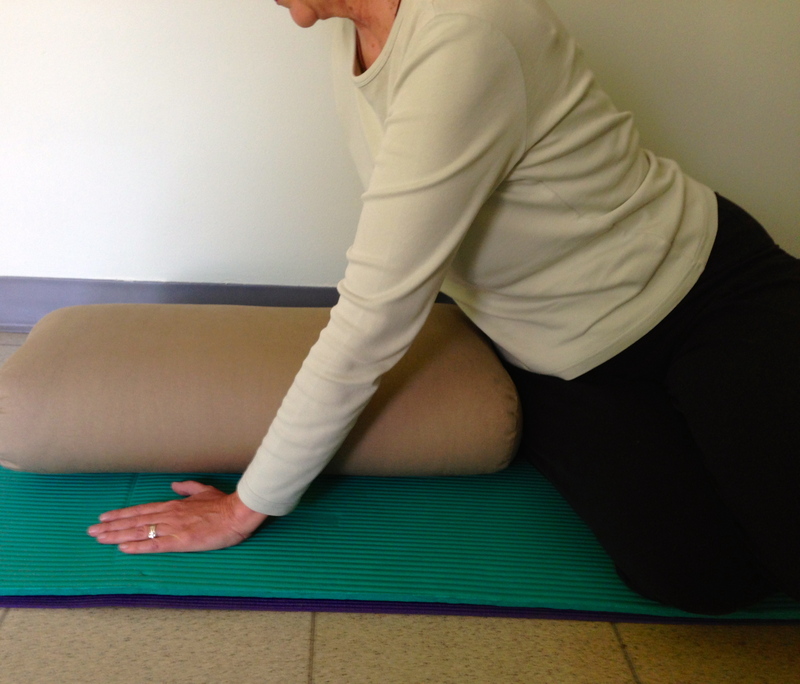 To enter the pose, place a bolster lengthwise on a yoga mat with one of the two short ends near the top of the mat. Sit on the mat at a 90-degree angle with your right hip against the end of the bolster, stacking your legs with knees bent toward the side of the mat. 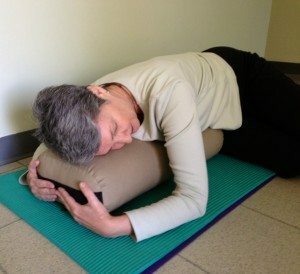 Gently turn your torso toward the bolster, placing one hand on either side, then slowly walk yourself down. 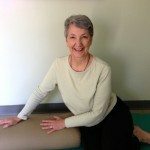 When your stomach reaches the bolster, turn your head in the same direction as your knees, resting your hands where they’re comfortable—I gently curve mine around the top of the bolster. Your legs can stay stacked, or you can give yourself a little more space to open the hips by simply leaving the leg closest to the mat in place, while drawing the other leg back until that knee is resting on the mat. Now turn the body and try the other side. Sit on the mat at a 90-degree angle with your left hip against the end of the bolster, stacking your legs with knees bent toward the opposite side of the mat. Read just your legs. Turn yourself toward the bolster. Inhale, and then exhale deeply as you fold down. Relax your hands where they feel comfortable. Once again you can give yourself a little more space to open the hips by simply leaving the leg closest to the mat in place, while drawing the other leg back until that knee is resting on the mat. Your head can stay facing the same direction as your knees, or can turn it in the other direction if that feels comfortable—your body will give you the signal if it’s too much. When you’re ready to sit, simply move your hands beneath the shoulders and gently press up.